The route de Bavella is often described by the guide book cognoscente as the most exciting, spectacular and dramatic road in Corsica. It is without doubt a major undertaking for the cyclist. It follows the D268 soon after departing the seaside town of Solenzara on the east coast. All the climbing action is in the first 31km rising from the sea to 1,218m at the Col de Bavella. The 7km stretch to the Col de Larone averages 7% and the 9km to the Bavella averages 8.5%. There are patches of up to 15% in this latter 9km. There is a short descent after Larone - keep an eye out for 'split tree rock' on your left. It's not long though before your climbing legs will be back in action for the sixteen or so hairpins to Bavella village - don't be tempted to stop as the Col is a little further on. It's a very obvious Col, look out for the Lady of the Snow statue with its many plaques and messages. You could turnaround at the Col and meander back down to the coast perhaps stopping in Bavella for refreshments and to swim in the Solenzara river - a perfectly respectable day out! My route however heads on for another 80km or so southwest to Zonza and then onto the Col de l'Ospedale before looping round and heading back to the coast. This is the only option as there are no other suitable roads within the circuit shown on the map. 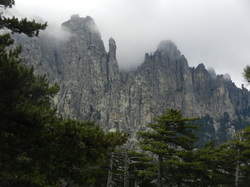 Zonza is Corsica's petit Chamonix. A climbing, hiking and extreme sports mecca as well as a useful stop to replenish before heading off. When leaving Zonza look for the D368 and NOT the 268! Start out ascending albeit more gently through the Fôret de Zonza. There are a couple of Cols to bag, Pelza and Illarta, before it levels out by the reservoir and then the l'Ospedale col. As the route profile shows you then drop off a cliff through the village of Ospedale for a steep and twisty descent to Palavese. Spare a thought for the pros racing up to the Col during the Crit International! From Pavalese the route is relatively flat for the run back to Solenzara.